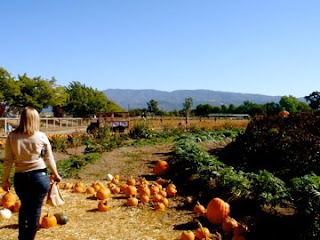 Today Jen and I headed up to Santa Ynez after church for a wonderful fall day. Stopped into Los Olivos Grocery for some local bread, cheese, an apple. Went to Briddlewood for their Syrah- goes down so smooth. I couldn't resist and bought a bottle called "English Pleasure." Who doesn't want a little English Pleasure in their life?! We had our lunch there outside, looking at the vines, catching up. 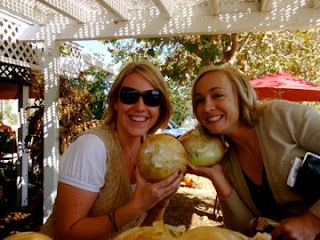 Next stop was the oh-so-popular Firestone for some good laughs with new super-LA chicas and then a stop at a market on the way home to encounter the world's largest onions and get some squash and a pumpkin to adorn the doorway. Happy October.